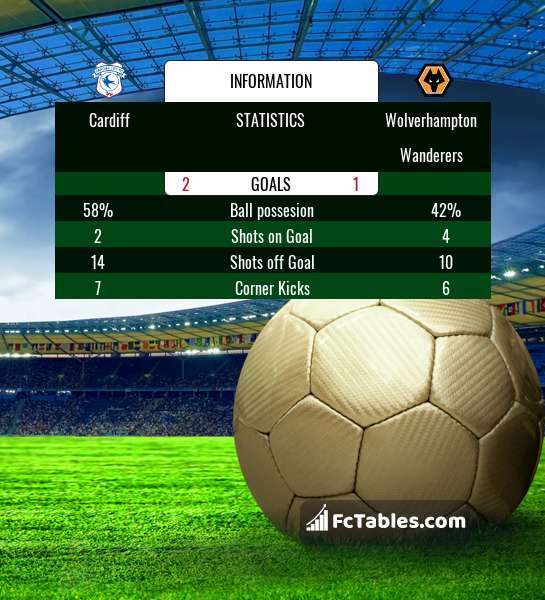 The match Cardiff-Wolverhampton Wanderers Premier League will start today 20:00. Referee in the match will be Andre Marriner. Team Cardiff is in the releagtion zone of the table. 19 position. In 5 last matches (league + cup) team gain 6 points. Leading players Cardiff in Premier League is: Callum Paterson 3 goals, Souleymane Bamba 2 goals, Josh Murphy 2 goals. Most assists in the club have: , Souleymane Bamba 1 assists. In Cardiff not occur in the match due to injury: Kenneth Zohore. Team Wolverhampton Wanderers is located in the middle of the table. (11 place). Form team looks like this: In the last 5 matches (league + cup) gain 14 points. From 5 matches can't win a match. In this season games Premier League the most goals scored players: Raul Jimenez 3 goals, Ruben Neves 2 goals, Ivan Cavaleiro 2 goals. They will have to be well guarded by defense Cardiff. Most assists in the club have: Raul Jimenez 4 assists, Ruben Neves 1 assists. Direct matches: Cardiff won more direct matches. 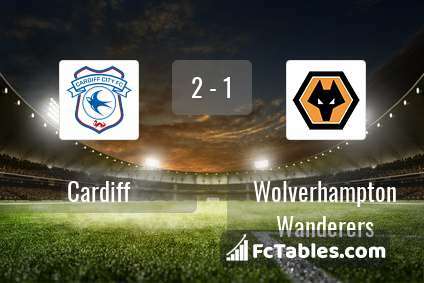 Cardiff won 10 matches , Wolverhampton Wanderers won 8 direct matches, was a 3 draws. In 14 matches the sum of the goals both teams was greater than 2.5 (Over 2.5), and 18 matches teams scored more than 1.5 goals (Over 1.5). In 13 matches the both teams scored a least one goal (Both teams to score).